This collection is designed for dogs with spots. From large and few to small and many, we have names to match a variety of appearances. 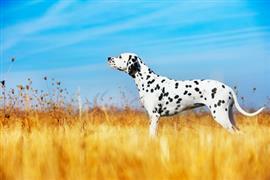 With the stark contrast of black (or dark brown) on white, the Dalmatian is perhaps the first breed that comes to mind. Ideas like Domino, Oreo, and Othello are fitting due to a shared color scheme. Other options are less color dependent and instead focus on the layout of the coat. A puppy with a few large spots could be called Patches. Another with many small speckles could be called Pixel, Dotti, or Pox. Cluster might be more fitting for the coat with several distinct groupings. Although the hue and arrangement may vary greatly, this list will have something that strikes a key for most spotted canines. Some of our pages will contain a subcategory. A subcategory is a slightly more specific grouping than the main topic of the page. For a subcategory, we will include a separated table of names and corresponding descriptions. An example of a subcategory of Red Dog Names would be 'Dog Names Inspired by Red Wines'. If you have any subcategory ideas for the Spotted Dog Names page, we would love to hear them. Use the form below to submit your ideas.